Major players operating in the global processed food and beverage preservatives market include Celanese Corporation, Kerry Group Plc, Koninklijke DSM N.V., GalacticSA, and E. I. du Pont de Nemours and Company. The processed food and beverage preservatives market is moderately competitive, with several large and small players competing against each other, notes Transparency Market Research (TMR). The top companies are consistently delivering premium quality products that conform to international standards to consolidate their market shares. To maintain a competitive edge along the forecast period, the players should be actively engaged in launching new products and making strategic mergers and impactful acquisitions. 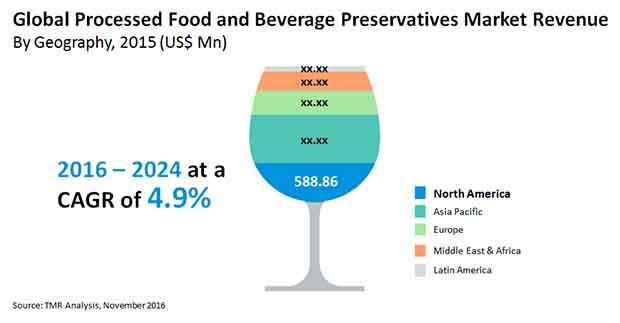 According to TMR’s estimation, the global processed food and beverage preservative market was estimated at US$1.7 bn in 2015 and is forecast to reach a valuation of US$2.5 bn by the end of 2024. The global market will expand at a CAGR of 4.9% during the period 2016 – 2024. On the basis of geography, the global processed food and beverage preservative market is segmented into North America, Asia Pacific, Europe, the Middle East and Africa, and Latin America. North America is anticipated to lead the global market and is estimated to expand at a 4.8% CAGR when measured in terms of revenue. The growth in the regional market is primarily attributed to surging demand for processed foods. Based on the type of product, the global market is segmented into synthetic and natural preservatives. The synthetic segment is projected to hold a noticeable market share and is estimated to attain a valuation of US$947.2 mn by the end of the forecast period. The significant growth is fuelled by the use of synthetic preservatives in extending the shelf-life of a wide spectrum of food products, their affordability at large, and their ability to enhance food flavor and appearance. In addition, the major synthetic variants that include antimicrobials, antioxidants, and chelating agents inhibit the growth of bacteria and mold, thus making the food safe for consumption. However, over the forecast period, synthetic preservatives will witness a slump in demand due to increased adoption of natural preservatives. The natural variants are expected to exhibit impressive demand as a large number of consumers across the globe are preferring food products containing natural preservatives over artificial additives. The increasing preference of natural over synthetic preservatives among people is due to their inclination towards organic food and its ability to add natural fragrances to the food items. Over the years, changing eating habits have led to the adoption of processed foods and beverages as a lifestyle choice. Coupled with this, the rapid pace of urbanization is a key factor propelling the growth of the processed food and beverage preservatives market across the globe. Owing to hectic daily schedules, people are finding less time to cook elaborate and nutritious meals at homes. Hence pragmatism concerns persuade several consumers to opt for processed foods and beverages. A large number of consumers are also buying frozen food items, ready-to-eat foods, and canned beverages, which has spurred the demand for synthetic preservatives, boosting the processed food and beverage preservatives market. An increasingly large number of consumers are choosing natural variants for preserving home-cooked food items, which can then be used for an extended duration. The trend is primarily driven by the need to avoid preparing some food items daily. In addition, the inclination of several food manufacturers to significantly prolong the shelf life of their products has led them to use a variety of artificial additives.